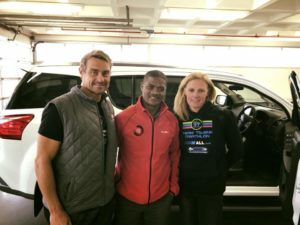 We are very excited to announce that TEAM TISSINK are now proud ISUZU Ambassadors. 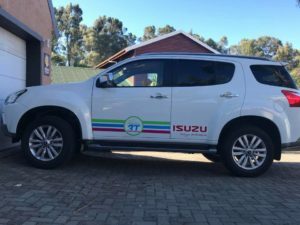 On Friday 16th August we were handed the keys to a brand new ISUZU mu-X, which will be branded and become the official Team Tissink vehicle. Isuzu’s latest masterpiece, the mu-X, is a full size 7-seater SUV, engineered to traverse the toughest of terrains, gracing the landscapes of Africa with presence and power. The Isuzu mu-X has a proven, proud history of performance behind it and an even longer road filled with adventure in front. Does that not ring true with the values and goals of Team Tissink coaches and athletes? Traversing the toughest of terrains with presence and power, a proud history of performance behind it, and long road filled with adventure in front.